George Chong is the author of Inorganic Chemistry Made Easy and Organic Chemistry Made Easy . 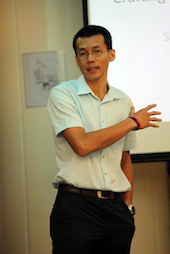 After graduating from Hwa Chong Junior College, George went on to the National University of Singapore to obtain his Bachelor of Science (Honours) in Chemistry. His many passions range from participating in endurance sport events to writing, teaching and imparting his knowledge to students. A firm believer that Chemistry is the central science, George went on to pursue his Masters in Science (Sports Science) degree which allowed him to integrate his Chemistry and Biochemistry knowledge with the field of Exercise Physiology and Biomechanics. George has been teaching Chemistry for 19 years, with the first 16 years of his teaching career in schools. He believes that to be a good teacher, one has to be able to relate concepts and enthuse students of different ability levels. He is humbled to have had the opportunity to teach students from many different walks of life, ranging from normal technical students in Zhenghua Secondary to high-ability prodigies in Hwa Chong Junior College and NUS High School of Math and Science. His last school was Anglo Chinese School (Independent) where he taught the International Baccalaureate programme. As a senior teacher for four years, he assisted in spearheading the Chemistry department. Since 2012, George and his wife Lynn, have started their own tuition place, Eureka Education (www.facebook.com/EurekaEducation.sg) to continue their love for imparting knowledge. George believes in constantly keeping himself abreast of the developments in the subject in order to be able to share his knowledge effectively with his students. Chemistry reference books written by local authors for local students are currently lacking. Schools provide good lecture notes, but students frequently complain of lack of practice exercises or lack of exposure to difficult questions. It is for this reason that this study guide was written by him. It contains both the concepts and worked examples that illustrate these concepts. In this study guide, there are more than one hundred examples with detailed explanations to cater to students of all levels of intellect.